I’ve been working on lots of painted furniture projects lately, mostly from refurbished pieces. This week I used an old shoe caddy, and turned it into something special with a little help from the Butterfly Transfer Printable HERE. I love using Annie Sloan chalk paint, because it goes on so smoothly and covers so well. Once it’s waxed the finish is so beautiful! I do love adding graphics, though, and before it’s waxed the decorative touches can be added to take it all to the next level. I’ve found that the carbon paper method can be somewhat messy with ASCP, but luckily I found another method that works well with the paint. First lightly spritz where you want the image directly on the furniture. You just want to barely wet it, not soak it down. Then put your image down on top and very lightly spritz the top with water. VERY LIGHTLY! To do the decorative painting, I like to mix a bit of acrylic paint with some latex. It gives it a beautiful finish once it’s dry. I used the liner to do the detail work and the filbert to fill in the butterfly. Take your time and go over the lines. You can see the unpainted portion just leaves a faint outline where I need to paint. I used my print as a reference to fill in all those missing details. After you let the image dry, then go over it with clear wax very carefully so you do not smear the paint. Even when it’s dry it has a tendency to smear somewhat. Buff out the wax over the image, then distress and wax the whole piece. Image Transfer Medium Testing – Replacements for 1Gel! 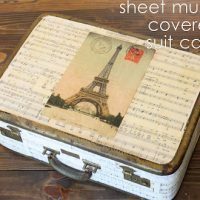 DIY Clear French Labels Project + free printable DIY Sheet Music covered Suitcase – Easy Decoupage! We simply love your creations, especially the transferts. We’ve tried to do some. You can see them on our blog. This is a great tutorial. 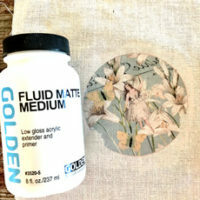 I use your graphics all the time using the mod podge method, but will have to try this over chalk paint next time. Thanks. What kind of printer did you use? Ink Jet or Laser? I had no idea you could transfer to chalk paint this way. I have used other methods and love having a new one. Thanks for sharing! This looks great! I use a plain old number 2 pencil on the back of my images. Tape in place and trace your image. I do all my signs like this. Super easy and cheap! Great idea Holly, thanks for sharing! Gina, this looks fabulous, great work and ‘sounds’ relatively simply, may have to try this myself on some of our designs 🙂 Thanks for the tutorial. Thanks so much for the great tutorial. I too would like to know if it was an inkjet print or a laser print. Sometimes, some of the projects posted on the graphics fairy specifically state what type of print we need to use. I am really excited about all of the projects and can’t wait to try my hand at transfers, so I would really love some clarification on how you did your transfer. This one is inkjet. Have fun transferring!! Hmm. I’m not sure what that means Suzanne. Stencils don’t usually rub on, they are applied using paint. Something new maybe? I have used this technique, I use wax paper. The end result was beautiful! I’m glad it worked for you Dailyn! Did you print the design on standard paper? can it be sealed with spray sealer?? Hi Niky, Often times it can be, but please read this post first https://thegraphicsfairy.com/top-tip-for-working-with-transfers/ before you try it! Not easy like it looks. Ended up doing it free hand over the hit of ink it left behind. No amount of rubbing seemed to make it any better. I’m sorry you didn’t have a good transfer experience but I bet the end result was beautiful! I read that if you use an oil-based sealer on an inkjet transfer, then it wont smear.